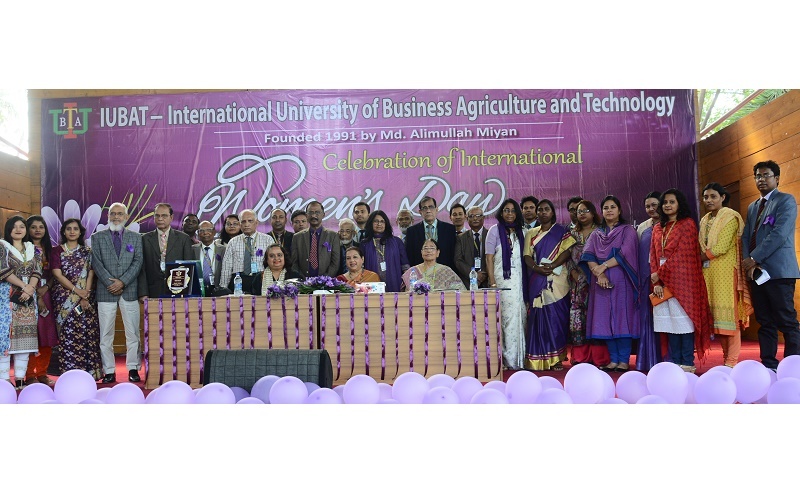 With the slogan ‘‘Think equal, build smart, innovate for change”, International University of Business Agriculture and Technology (IUBAT) observed the International Women’s Day 2019 at its Auditorium. To mark the International Women's Day, IUBAT Students made a rally carrying burning candles in their hands. The programs included discussions and dialogue followed by a cultural gala. Former Member of Parliament and National Award winning Actress and social worker Sarah Kabori was the Chief Guest. Professor Dr Hamida Akhtar Begum, Pro Vice-Chancellor of IUBAT presided over the ceremony. IUBAT Treasurer, Prof. Selina Nargis and Alumni Director AKM Sharfuddin delivered their speech highlighting the essence of the day. The program was coordinated by Assistant Professor Syeda Ajanta Israt. Assistant Professor & Deputy Director; International Programs, Md Sadekul Islam offered the vote of thanks. The program was well attended by local and international students, faculty, and officials of IUBAT.